After empty promises before, let me begin a story based in the wonderful game of Simutrans. I hope you like it. If there are any comments, requests or suggestions, let me know! This is a story about a vibrant tropical group of islands in the east central Pacific Ocean called Burtonesia. Burtonesia began life in the 1500s, when Portuguese explorers first sighted the islands. Although uninhabited, the explorers found the islands too humid for their liking. They simply planted a Portuguese flag, named the archipelago As Ilhas do Santo Eduardo, and left. More serious settlement took place 200 years later, when Portugal founded the city of Santo Eduardo on the biggest of the islands. Settlements would appear all over As Ilhas do Santo Eduardo, as the Portuguese became adapted to the humidity and created a colony. However, in 1820, needing money, the Portuguese Empire sold the islands to Great Britain, who renamed the islands the Burton Islands (after James Burton, the man who brokered the sale of the islands). The main island was renamed the Island of Burton. The British wasted no time in rearranging the settlements to their liking. They set aside territory for the Portuguese settlers and claimed the majority of land for themselves. Although the Portuguese settlers were not happy about the situation, they agreed to it in exchange for full citizenship and the right to local autonomy as well as the right to keep their language and the Catholic religion. Over the next 90 years immigrants of many ethnicities from all over the British Empire as well as the Portuguese and Brazilian Empires moved to the Burton Islands, developing a unique society. Wanting to further develop its own society, the people of the Burton Islands pressed for independence, which was granted in 1930. The name of the new nation was Burtonesia. The new government felt that transportation was the key to developing Burtonesia, and a huge portion of the national budget was set aside for that purpose. Transportation development began in 1930 with freight truck lines on the Island of Burton run by the government-owned National Transport (NT), and the first passenger buses were deployed in 1932. We begin following the story of NT in detail in 1934. Although NT has not yet built any train lines, with a few freight truck and ship lines, the NT network is booming. In 1934 there are 10 counties. 1) SHIN-NIPPON COUNTY - Shin-Nippon means New Japan. Among the many immigrant groups to Burtonesia in the 1800s were the Japanese. They set up roots on the western tip of Burton Island, and they became so entrenched there and so involved with the development of the area that upon independence, a Japanese-speaking county was created. Despite the ethnic Japanese majority, a large Anglo-Burtonesian population lives there, and English is co-official with Japanese. 2) ST. ADAMS COUNTY - The longest county and one of the largest. Largely Anglo. 3) SÃO JOÃO COUNTY - One of the three Luso-Burtonesian counties. In 1934 this long coastal county is underdeveloped. 4) ST. DAVID COUNTY - Named for and consisting of the English-speaking St. David Island, which in turn gets its name from the city of St. David on the western tip of the island. 5) SANTO EDUARDO COUNTY - The largest Luso-Burtonesian county in terms of area and population. The county capital, Santo Eduardo, was the first settlement in Burtonesia. In 1934 it is the largest predominately Portuguese-speaking city in Burtonesia. 6) ST. CHARLES COUNTY - Perhaps the most populous county in Burtonesia in 1934. The national capital and largest city, Fairmount, is here. St. Charles County is the political, economic, and educational center of Burtonesia. The transportation network is quite developed here, compared with the other counties. Both English and Portuguese are official languages here. St. Charles County and Shin-Nippon County are the only counties with two official languages. 7) ST. JAMES COUNTY - Largely Anglo. In 1934 St. James County's economy is second only to St. Charles County's. Despite being mainly rural, National Transport's industrial efforts in the county to date has caused a boom in the economy. 8 ) ILHAS VERDES COUNTY - The smallest of the three Luso-Burtonesian counties. It consists of two small islands: Presidente Island and Barretos Island. 9) SOUTHWEST ISLANDS COUNTY - A collection of four Anglo-Burtonesian islands. The two northernmost islands - Wells Island and Birmingham Island - did not really want to join the other two islands (St. Michael and Truro), but do not really have the means to form their own county at this time. 10) ARLINGTON ISLAND COUNTY - The most populous of the "offshore" islands. Largely Anglo. This is central Fairmount, the capital of Burtonesia and its largest city. Despite that, only 9,800 people live here. The government, however, is hard at work expanding the city into a metropolis. Fairmount is the only Burtonesian city with intracity public transportation; three city bus lines have been set up here. To the west of Fairmount, at the westernmost point of St. Charles County, is the town of Gloucester. Gloucester produces the food for the relatively urbanized county. Grain is transported by ship and truck all the way from Arlington Island (more on that below) to St. James County, where it is transformed into flour and brought here. Sheep, raised in the island's mountainous areas, is the preferred livestock of choice, and sheep meat is brought here by truck from St. James County as well. The ship in the top of the picture is a fish boat bringing in the day's catch from the Burtonesian Strait, the body of water that separates Burton Island and the various offshore islands. This is the grain farm on Arlington Island, just up the mountain from the island's largest city, Arlington. The road up the mountain is National Transport's biggest engineering feat to date. Several trucks collect grain and haul it down to the Port of Arlington, where it is shipped across the strait to St. James County, where it is made into flour. 1 How long do you plan on running this story? 2 Do you plan on adding large rail networks that span the many counties on the islands? As long as the save is profitable. Having a little trouble with that at the moment. My ultimate goal with this story was to eventually have train lines spanning the islands (or at least the biggest one), carrying passengers and goods. However, I tried changing a few of my most profitable and busy truck lines to train lines, and they've become unprofitable, so I've taken a step back and have started searching about how to make train lines profitable. Until then, road vehicles it is! Patching multiple saves together is something I would be interested in, but have no clue about. I'll check out that video and see what the Japanese players did. In the past ten years, industrial transport activity remained confined to St. Charles (number 6 on the map), St. James (7) and Arlington Island (10) counties. However, passenger transport grew a lot, as bus lines began to fan out throughout the young nation. By 1944, bus lines connected Fairmount with five other county capitals: Santo Eduardo and St. James to the east, Arlington (via a ferry) to the southeast, and Jackson City and Takagawa to the west. The city of Takagawa is quite far from Fairmount, but getting a road link completed quickly had become a political priority. The people of Shin-Nippon County, which has a majority Japanese-Burtonesian population, had started to feel isolated from the rest of the nation, and there were grumblings of breaking from Burtonesia and forming a separate country. Worried that this could lead to Japan invading the islands, the Burtonesian government pressed forward a road linking all major cities along the southwestern coast of Burton Island from Oxford to Takagawa (as shown below), which was completed in early 1944 along with bus services by National Transport. For the first time, it was now possible to go by public transportation all the way from Takagawa in the northwest of the country to Arlington in the southeast. NOTE: Not all the roads above have bus or freight services as of 1944 - specifically the road in the east from Santo Eduardo through the mountains to St. James. A shot of the town of Oxford in 1944. The road to Takagawa began at the bridge on the left of the picture, while the road running north leads to Hamilton and Jackson City, making Oxford an important transportation hub. Roads were not the only transportation links built between 1934 and 1944. Two relatively-short freight train lines were built as well. One was built from the port of Leicester to an area close to the grain mill at Westminster, transporting grain arriving at the port from Arlington to the mill. The second line was actually a line which shared most of the track with the Leicester grain line. It ran from near the steel mill in Hempstead to a goods factory in Leicester. However, this line proved to be financially inefficient, and it was closed after only a few years. The third rail line built was a food freight line, carrying food from a factory in Gloucester to a supermarket in Fairmount. This line is by far the most profitable of the two existing train lines in Burtonesia. The current head of National Transport, Bartholomew Johnston, has high hopes for road transportation in the nation, and he has said NT has no plans to create more rail lines at the current time. The two purple lines show the two freight rail lines in existence in Burtonesia in 1944. The modest rail platforms at Leicester Port. The freight station at Westminster grain mill. The unusual winding road at the entrance of the station serves as a waiting area from trucks coming from the grain rail transfer station (right of the picture), keeping them off of the main national road. With some 90 convoys, the busiest freight truck service in the last ten years was the one carrying sheep meat from a farm high in the mountains some distance east of Fairmount, to the food factory in Gloucester. There was only one road from the farm to the factory, and that road went straight through the heart of Fairmount. Unfortunately, as Fairmount grew and as more people bought private cars and took trips to Fairmount from other cities, increasing traffic started to slow the trucks down, cutting into profits. The national government decided to build a bypass road in open land just north of Fairmount. Moreover, it was decided to make the road a two-lane divided one, to allow for trucks to overtake slower cars and save time on trips. Completed in 1943, it was the first divided highway in Burtonesia, and it was a success. The highway was named after the first prime minster of Burtonia, James Russell, who served from 1934 to 1942. The light green line shows the divided part of the PM Russell Highway. This helped to speed up the trek between the sheep farm (A) and the food factory (B). Two grey and green NT trucks motor on the PM Russell Highway just north of Fairmount. An NT bus arrives at the bus stop in front of Fairmount's city hall. BBGunn, I would like to ask you to avoid posting multiple posts in a row in the same thread within a short period of time when this is not necessary. You can use the "horizontal rule" (this button or hr tag) to split long texts into parts. Pretty cool map, by the way. I apologize about that. I didn't know about the horizontal rule button. I tried to put all of that into one post at first, but the forum didn't like it. EDIT: I tried to go back and combine the three posts into one using the hr tag. However, I had the same problem that I had originally - the forum didn't like the long post and it would not save. Perhaps there are too many images. I guess, aside from violating the forum rule about multiple successive posts, the only option I have is to put less images into a post. EDIT #2: I found a way to merge the three posts: I changed most of the images to URLs. It shouldn't hurt all of you to click on the link to see the pictures, now, should it? Do post more. There's a depressing lack of these screen-shot threads and journals on here! I will when I get time, but... I will start this map over from the beginning, because I went horribly bankrupt. :( I'm glad I saved the map before building anything. Anyway, I did start a new game with the same Burtonesia map. The cities and counties I talked about in the first post are more or less the same. The company, National Transport, is the same - but now in glowing purple! I think one reason I went bankrupt in the last version of this map was because I started with a freight-first strategy, when I am used to a passenger-first strategy. I don't know why, but I do better with passenger networks than with freight networks. So right now, I'm busy just connecting cities with bus lines. This is the center of the national capital, Fairmount, in 1932. You can see two RVg-KS 33 buses around the city hall. These buses are used for the four intra-city lines in service in 1932. 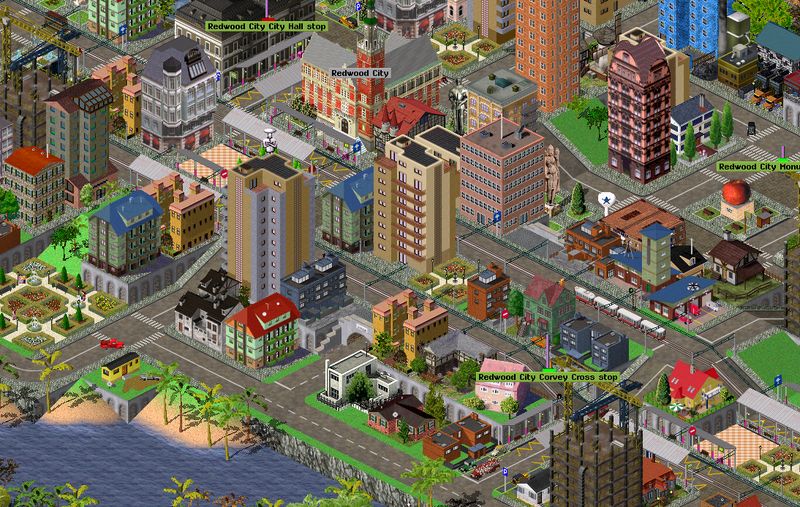 Two of the lines connect city neighborhoods, while the other two connect the main bus station at city hall with some nearby industries. RVg-KS 33s have the highest passenger capacity of all buses in 1932 - handy for big cities. On the other hand, Gaz-3 buses are almost exclusively used for inter-city transport, mainly because of their top speed in the era (58 km/h). Here is a Gaz-3 trucking through dense jungle along a road just north of Santo Eduardo, the largest Portuguese-speaking city. EDIT: I'm not sure why, but some of the images I linked to previously are no longer on the simutrans-germany.com server, even though I put a "0" in the days valid box when uploading them, which should make them available for three years. I apologize for that; however, the two images in this post are working fine as I type this. Now it's 1968 in Burtonesia, and the fledging island nation has come a long way since its independence in 1930! Below is a map of the nation, with the counties labeled for reference. Again, here are the names of the counties, with updated explanations. 1) SHIN-NIPPON COUNTY - Shin-Nippon means New Japan. Among the many immigrant groups to Burtonesia in the 1800s were the Japanese. They set up roots on the western tip of Burton Island, and they became so entrenched there and so involved with the development of the area that upon independence, a Japanese-speaking county was created. Despite the ethnic Japanese majority, a large Anglo-Burtonesian population lives there, and English is co-official with Japanese. The county has only three incorporated cities in 1968, but the largest (as well as the county capital), Takagawa, is the seventh-largest in Burtonesia. 2) ST. ADAMS COUNTY - The longest county and one of the largest. Largely Anglo. Jackson City is the county capital. 3) SÃO JOÃO COUNTY - One of the three Luso-Burtonesian counties. In 1968 this long coastal county is still somewhat underdeveloped. Castro is the capital. 4) ST. DAVID COUNTY - Named for and consisting of the English-speaking St. David Island, which in turn gets its name from the capital of St. David on the western tip of the island. 5) SANTO EDUARDO COUNTY - The largest Luso-Burtonesian county in terms of area and population. The county capital, Santo Eduardo, was the first settlement in Burtonesia. In 1968 it is by far the largest predominately Portuguese-speaking city, and the second-largest city of any type, in Burtonesia. A ton of growth has happened here since the 1930s, mainly the creation of suburbs around Santo Eduardo city and the growth of the southern towns near metro Fairmount, which house a sizeable number of Portuguese speakers that work in Fairmount. 6) ST. CHARLES COUNTY - The most populous county in Burtonesia in 1968. Eight of the largest 11 cities in the nation are here, including the national capital and largest city, Fairmount. St. Charles County is the political, economic, and educational center of Burtonesia. The transportation network is quite developed here, compared with the other counties. Both English and Portuguese are official languages here. St. Charles County and Shin-Nippon County are the only counties with two official languages. 7) ST. JAMES COUNTY - Largely Anglo. The last 30 years have seen an increase in the population of the county capital, St. James, and its surrounding towns, while beach towns have sprung up between St. James and Leicester. 8 ) ILHAS VERDES COUNTY - The smallest of the three Luso-Burtonesian counties. It consists of two small islands: Presidente Island and Barretos Island. Presidente is the capital. 9) SOUTHWEST ISLANDS COUNTY - A collection of four Anglo-Burtonesian islands. The two northernmost islands - Wells Island and Birmingham Island - did not really want to join the other two islands (St. Michael and Truro), but do not really have the means to form their own county at this time. Brighton, on St. Michael island, is the capital. 10) ARLINGTON ISLAND COUNTY - The most populous of the "offshore" islands. Largely Anglo. Arlington is the capital. Burtonesia started out with just one transportation company - National Transport. But trying to establish transportation links for the whole nation proved to be tough, and NT had squandered almost all of its funds. The government then decided to allow regional transportation companies, each concentrating on the transport needs of a part of the nation. Paradise Movement, Inc. - The first regional transport company to begin operations. It serves Arlington Island. TSE (Transporte de Santo Eduardo) - As the name states, this company serves Santo Eduardo county. Western Transport - This company has the largest footprint. It serves St. Adams, São João, and St. David counties. Seibu Kotsu - Serves tiny Shin-Nippon. Ilhas Ocidentais Transporte - Serves the Ilhas Verdes. Southwest Isles Transport - Serves Southwest Islands County. National Transport was left to serve St. Charles and St. James counties. However, it could not recover from mistakes made in the past, and the company went bankrupt in the 1940s. Other companies wanted to "swoop in" and divide the metropolitan Fairmount territory, but the government simply wanted a replacement, and Capital Transport Networks was created. Here is a map of the metropolitan Fairmount area, Santo Eduardo to the northeast, and St. James to the southeast. The understated main railroad station. Trains go northwest of here to Richmond, southeast of here to Hempstead and Leicester (where one can catch a ferry to Arlington Island or a bus to St. James), and northeast of here to Santo Eduardo. That is the extent of the rail network. The railroad station is on the outskirts of the Fairmount city limits, so busses connect the station with the central business areas. A lot of pedestrian traffic comes to this area in the southwest of Fairmount city. A lot of discussions have taken place on how to expand public transportation in this area. The airport connects metropolitan Fairmount with Arlington Island and Truro Island. It lies on the easternmost fringe of Fairmount, just north of Hempstead. Truro Island has seen some surprising growth over the last 10 years, and the airport - the first built in the nation, due to money-losing ferries to Arlington - is consistently crowded and in need of expansion or more flights. Note the traffic on the road north of the airport. This is the only road connecting the three cities of the island. A couple of things make this bus terminal interesting and controversial. First, it was built far away from the city center, in the middle of nowhere. Second, the government built the railroad over the terminal to avoid at-grade crossings for some reason (not much traffic in the area). Nevertheless, this is an important (the only?) bus terminal for those in cities surrounding Santo Eduardo. They can catch trains here that go all the way to Fairmount, and even some to the center of Santo Eduardo, where the rail line terminates. A lengthy divided highway with a 110 km/h speed limit was built that starts from west of Cambridge, goes through Richmond and Fairmount, and ends south of Hempstead - helping to ease traffic problems in the metropolitan Fairmount area. A spur that goes north of Cambridge, and into a new road leading to Hamilton and Jackson City, was built, and you can see the junction here. In Burtonesia, short-haul trucks take goods from a factory to a nearby distribution center, where the goods are then picked up by short-haul trucks that take it to a nearby factory, or by long-haul trucks across the nation to another distribution center, where other trucks take them to their final destination. This distribution center is located near a cluster of tree plantations, and long-haul lumber trucks that cross the nation are a lucrative source of income for the Seibu Kotsu company. Finally, if there are any areas of the map where you would like me to take some screenshots, please let me know and I will do my best! Currently working on a game in pak128 whenever I have free time. The transportation system is far from ideal, but in the meantime here is a shot of the downtown area of the largest city in the game, Redwood City. Redwood City sits on a harbor and is a bit hilly, creating some transportation challenges. There is also quite an eclectic mix of buildings in the city! All building designs are welcome, it seems!